Grenville, Sir Richard (1542–1591), naval commander, was born in May or June 1542, the son of a sea captain, Roger Grenville (d. 1545) of Stowe, Cornwall, and Thomasine, daughter of Thomas Cole. The Grenvilles were a substantial gentry family, with lands in both Devon and Cornwall. His grandfather Richard (d. 1550) had been knight marshal of Calais when Arthur Plantagenet, Viscount Lisle (whose wife was a Grenville), had been lord deputy, and his estate was valued at £237 p.a. 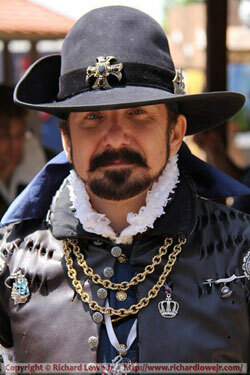 The younger Richard's father was master of the Mary Rose, and drowned when she capsized in the Solent in July 1545. Shortly after this disaster Richard's mother married Thomas Arundell of Clifton, Devon, and his wardship was granted to one Nicholas Wadham, who relinquished it on 21 November 1550 to Sir Hugh Paulet. Paulet appears to have managed his ward's lands at Bideford and Buckland, Devon, and Stowe, Cornwall, but had no recorded influence as a guardian. Instead Grenville seems to have been brought up by his mother and stepfather at Clifton, but virtually nothing is known about the circumstances; he was probably educated at home by private tutor. In Michaelmas term 1559 Grenville enrolled as a student at the Inner Temple. He remained in London for at least three years. On 19 November 1562 Grenville became involved in a brawl somewhere in the parish of St Clement Danes, in the course of which he stabbed one Robert Bannester to death. For this offence he was indicted; he fled, and was outlawed. Family influence or mitigating circumstances obtained his pardon in 1563, and in June he was licensed to enter upon his estates. Late in 1564 or early in 1565 he married Mary, the daughter of Sir John St Leger of Annery. Their first child, Roger, died in early infancy and was buried at Kilkhampton, Cornwall, on 10 December 1565. Three further sons and three daughters were born of the union. Grenville's whereabouts between 1565 and 1568 are uncertain, although there is a tradition that he served with a band of Cornish volunteers in one of the emperor Maximilian's campaigns in Hungary. In 1568 he accompanied his kinsman Warham St Leger to Ireland and was subsequently appointed sheriff of Cork. He remained in Munster for about eighteen months, contributing 106 followers to a small English settlement near Cork, and was actively involved in the suppression of serious disorders. His wife accompanied him, and was for a time besieged in Cork while Grenville sought further support from England. In 1570, following the northern uprising, it was required that all justices of the peace and other officers should take the oath of supremacy already required of clergy. Grenville was sworn on 28 April at Bodmin, although there is no evidence that he was then on the commission of the peace; his earliest appearance in that capacity was in 1573. Nothing is known of the religious affiliation of his stepfather, Thomas Arundell, but Grenville never showed any affection for the 'old religion', and is always counted as one of Elizabeth's protestant 'sea dogs'. Grenville first became interested in maritime adventures about 1569, probably as an investor rather than a practitioner, because he was heavily committed in Ireland at that time. How he obtained his seafaring experience is not clear, but it was probably through business connections with John Hawkins. In 1574 he purchased the 200 ton Castle of Comfort jointly with Hawkins, the intention being to send her on a piratical voyage to the Carribbean, under the pretext of seeking 'terra australis incognita'. Elizabeth, however, had been at great pains to rebuild her relations with Philip II after the tensions of 1568–71, and the patent for the voyage, although originally granted, was revoked. Instead the Castle of Comfort was used as a privateer under licence from the prince de Condé, but what share of the profit came to Grenville is not apparent. Grenville sat as knight of the shire for Cornwall in the brief parliament of April–May 1571, and a Mr Greenfield, who may or may not have been Richard, served on a number of committees, including that for religion. At some point between 1574 and 1576 he was knighted, and he served as sheriff of Cornwall in 1576–7, so his absence from the parliament of 1572–84 does not seem to have been occasioned by any loss of favour. It may rather be attributed to a growing preoccupation with business which took him out of the country. In or soon after 1578 Grenville became interested in Sir Humphrey Gilbert's plans for planting a colony in the New World, and for seeking the north-west passage. Gilbert made two voyages, in 1578 and 1583, in which Grenville was probably an investor, although he does not seem to have sailed on either of them. Gilbert was lost at sea in the latter year, but his plans were immediately picked up by his cousin, Sir Walter Ralegh, and in these plans Grenville's involvement was practical and immediate. By 1585 war with Spain was imminent, and the council evolved a strategic plan for seizing the initiative in the Atlantic. In April Grenville departed to plant an English colony on the mainland of North America, within reach of the Spanish treasure route; in June Bernard Drake was sent to Newfoundland; and in September Sir Francis Drake sailed for the West Indies, in what was the first official act of the war. The choice of Grenville to convey Ralph Lane and his colonists to Virginia is significant, because it was a task requiring a seaman of status, skill, and experience, and there is no evidence of how Grenville acquired the latter two qualities. After leaving Lane and his colonists at Roanoke, Grenville went privateering and took a number of prizes. One, taken off Bermuda, yielded a cargo that he himself estimated at £12,000–15,000; other evidence suggests it may have been worth as much as £50,000. The discrepancy between these figures is significant, because the former represents the declared value, against which the shareholders would have been paid. The latter, if true, demonstrates the profit that the captain (and to a lesser extent the crew) would have derived, and helps to explain the enthusiasm for such ventures. Virginia seems to have been intended, not so much as a colony, but rather as a privateering base, since it was required to pay for itself from the beginning. Lane's decision to abandon the project in the following year, 1586, was due not so much to faint-heartedness or shortage of food as to the inability of the settlers to find a deep-water harbour out of which to operate. Both Ralegh and Grenville intended to keep the Virginia base supplied, and Grenville actually returned to Roanoke with a small fleet only weeks after Lane and his men had left. Frustrated of a part of his purpose Grenville then turned again to privateering, and took enough prizes to cover the costs of his voyage. He seems to have planned a further voyage with three ships in the summer of 1587, but it was almost certainly abandoned, since Grenville was assembling ships and men for another voyage by the end of the year. On that occasion he was overtaken by events, because the council had good warning of the preparations being made in Spain, and prohibited any ships from leaving England on private expeditions. Grenville was instructed to hand all his ships over to Drake, and did so, with the exception of two pinnaces, which made an unsuccessful voyage and probably cost their owner a fair slice of his earlier profit. Rather surprisingly, although he contributed three ships to the fleet that sailed against the Armada in 1588, Grenville seems not to have been at sea himself. This may have been because of his local status and responsibilities in Devon and Cornwall. He had been a vice-admiral under Lord Thomas Howard since 1571, and a commissioner for musters since before 1577. In the parliament of 1584–6 he again sat as knight of the shire for Cornwall, and in 1587 had been appointed a deputy lieutenant, which would have meant a front-line command in the home defence forces during the Armada crisis. In 1589, while Drake and Sir John Norris were making fools of themselves at Lisbon, Sir Richard was at sea again, raiding the Azores, but without any very conspicuous success. In 1591 he was back on the same station, this time as vice-admiral under his old superior, Lord Thomas Howard, and in command of the queen's ship Revenge, a 500 ton galleon of modern design. Howard's intention was to intercept the treasure fleet from America, but the Spaniards (as usual) were well aware of his presence in the Azores, and sent out a powerful fleet of about fifty ships to see the precious silver through this blockade. Howard received intelligence of the Spanish fleet on 31 August, while at anchor on the north side of the island of Flores. Himself commanding only about sixteen ships, and having no necessity to confront such odds, he decided to retreat. Many of his men were sick, and many were ashore when warning of the Spanish approach was received, but he succeeded in putting most of his fleet to sea, and was able to stand off, well out of reach of interception. The Revenge, however, remained behind. There are many accounts of what followed, several of them contemporary, and although Walter Ralegh did his best to justify his kinsman's action, the consensus of opinion is that Grenville acted ridiculously. There was no reason why it should have taken him any longer than it took the other captains to get his men aboard, but he made no attempt to follow his admiral, in spite of being expressly ordered to do so. Either he did not receive the order, or he thought the approaching squadron was the anticipated treasure fleet. For whatever reason, he apparently decided to sail straight through the middle of the enemy. This was not because he lacked the skill to take evasive action, and he seems to have taken his decision in a spirit of passionate and angry determination. Grenville was a knowledgeable seaman, but he had no experience of serious fighting at sea, and he may have felt a contempt for his opponents that a more seasoned campaigner would not have shared. The inevitable happened. Although in fact only about twenty of the Spaniards were fighting ships, and Howard's decision to withdraw may have been premature, they were more than enough to destroy the Revenge, which became trapped among them and so was unable to exploit her superior sailing qualities. Grenville was mortally wounded, most of his crew killed, and his ship reduced to matchwood. Whether the Spaniards were more impressed by his reckless courage or amazed by his folly is not apparent; he had taken one of their ships and a fair number of their men with him. Sir Richard Grenville's last fight quickly became the stuff of legend, but his actions have never been satisfactorily explained. 'Wilful and obstinate' he was called by Sir William Monson a generation later, and it seems that the same defect of character that had caused him to kill a man in a street brawl in 1562 was his eventual undoing. Both Ralph Lane, who knew him well, and Jan Van Linschoten, who was in the Azores at the time of the battle, made adverse comments on Grenville's character. He was, Lane told Sir Francis Walsingham, a man of intolerable pride and insatiable ambition, while Linschoten described him as being so fierce and hard that his own men hated him, although his courage was greatly respected, even by his enemies. Perhaps he was deliberately seeking death, but there is no suggestion that he saw himself as a martyr. Richard Grenville died at sea of his wounds on 2 September 1591. His son Bernard did not receive the administration of his estate until February 1593; there may have been some difficulty about verifying his death, or a dispute over his inheritance. Bernard died in 1636, and at the end of the nineteenth century there were four Cornish families claiming descent from him. Sir Richard Grenville and the last fight of the Revenge were together immortalized by Alfred, Lord Tennyson, in his poem 'The Revenge: a ballad of the fleet', published in Ballads and other Poems (1880).